The Rose Garden Riverside, a complete resort by the Ta Chine River, is situated 32 Km west of down town Bangkok. Set in 70 acres of lush tropical gardens and immaculately manicured lawns, the hotel offers 188 rooms in three different types of accommodation, including a 160-room deluxe family-style resort hotel, a lakeside hotel and seven antique Thai-style teak houses surrounding a picturesque lake. - Only meals charges apply for children below 12 years of age occupying the same room with parents. - If more than one room is required, the single rate applies to each room. waived if meals are combined with either accommodation or Cultural Show. There are 188 guestrooms comprising 82 rooms with river view, 73 rooms with garden view, 12 rooms at lakeside rooms and seven Thai-style teak houses. All rooms are equipped with mini-bar, air-conditioning, satellite TV and IDD telephones. 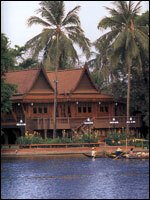 There are seven Thai Teak Houses of different sizes and character at The Rose Garden. These classic Thai houses are around 100-years old and have been built according to the traditional Thai architectural-style. They are rectangular in shape and are raised off the ground on sturdy round posts. Both the pillars and walls incline slightly towards the top adding to its graceful suggestion of height. This elegance is further accentuated by the steep tiled roofs. These houses are made entirely of teak from the paneled walls to the doors, windows and gable-end. Each house has been lovingly restored to absolute luxury. The bedrooms and bathrooms are equipped with the modern facilities which have been tastefully incorporated into the original antique design of the Houses. The curved legs of the beds and tables, bedspreads and curtains in pure cotton featuring traditional motifs in the Khomaphatra design complete the elegant look. All rooms within the Thai Houses have their own private bathrooms. All Bedrooms are air-conditioned while ceiling fans in the living areas keep the air circulating. All of the Thai houses overlook the lake and offer a picturesque view. The Rose Garden Riverside matches deluxe accommodation with richly rewarding choices of fine dining. Eight superb restaurants offer a wide variety of cuisines from an international buffet to specialty Thai and Japanese delicacies. The Piano Bar in the lobby offers quiet relaxation while the Karaoke Room provides more lively entertainment. Special functions, such as sunset cocktail cruises and poolside barbeques, theme parties in the garden or in a traditional Thai teak house, can be arranged. 100-year Thai Teak house with its magnificent lawn by the lake. A perfect place for a Thai guests. Our Award Winning, "An Evening at the Rose Garden", exclusive Thai night theme in the park for Conventions and incentives from 60 to 3,000 guests. Merit choice, rice barge cruise, Thai cooking class, soap, fruits & vegetables carving, garland making, Thai dance lesson, boxing class, T-shirt painting, umbrella painting, botanical walk to tropical plants, children's playground, shopping arcade and beauty salon. Daily Cultural show at 14.45 hrs. featuring 150 performers including seven elephants. Rose Garden Golf Course, 18 holes -par 72, one of Thailand's most popular golf course. The proud winner medal award by Golf Magazine of USA for being one of the world's top 24 golf resort and the best 25 golf courses in the world by Golf Magazine of UK. Ozone treated swimming pool, Tennis Court, Fitness center, Steam room, Paddleboat, Elephant ride, Bicycles, Air gun shooting range and Games room.